Looking for a fun way to workout? 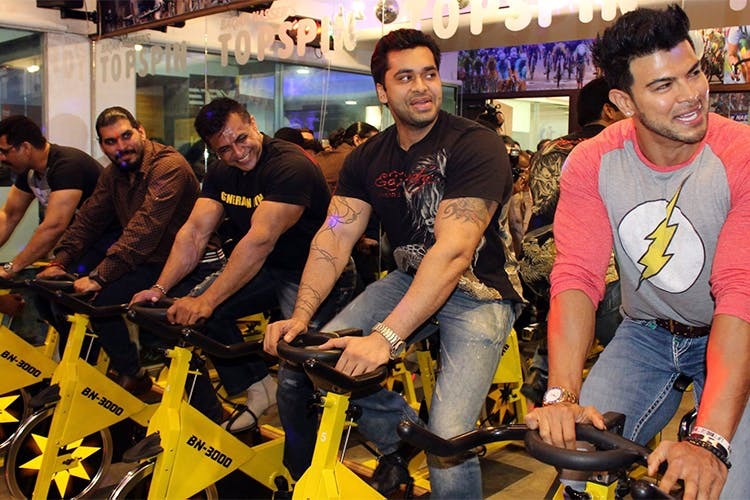 Topsin at Napeansea Road may be just that because it’s all about burning those calories through indoor cycling. If you’re all about cardio fitness, then you might want to consider Topsin in SoBo. Topspin is an aerobic cardio fitness workout where through different techniques you adopt a calorie burning regime that’s both fun and effect-oriented. As the website suggests, “this is an indoor group cycling program which is done at various speeds to maintain a certain level of heart rate with pumping music, psychedelic laser lights and an electrifying as well as lounge atmosphere that adds an extra punch to your workout”. Here, you have a trainer that will look into your regular regime, motivate you to do more, decide the levels at which you should move, choreograph each session and much more. This class offers a complete endurance and strength workout and you only need o do it thrice a week. Isn’t that awesome? At this class, on an average you will burn about 800 calories and is designed to suit all ages. At the helm of this is trainer Baqar Nasser, who is an 11-time National cycling champion and will leave no stone unturned in helping you achieve the body of your dreams. On a monthly basis, the membership will set you back by INR 7,200. We love this different and fun workout and are definitely going to give this one a shot to achieve our #fitnessgoals for 2017!